I have been surprised that now that this challenge is coming to an end, it is more difficult to choose what to purchase with my remaining money. Should I continue to buy basic foods in addition to what is on sale, or since I have enough food to last this last week, should I spend it to splurge a little on the things that I miss? I also have to make the decision of whether I am going to continue the challenge past the one month I decided to try it with that decision having a big influence on how I spend the remaining money. It has been an unexpected dilemma which I hadn't expected. I started off my morning with my usual instant oatmeal flavored with a bit of the 100% grape / peach juice. It is pretty good now that I have perfected the amount of juice / water mix to put in it. 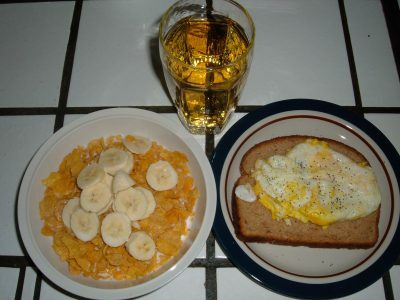 For my larger breakfast, I had a bowl of Corn Flakes with banana on top, and a piece of whole wheat toast with an egg on top. I also got to use my salt and pepper for the first time (it's amazing how little things like that can make you so happy when eating on a limited budget). I also had a glass of half water / half grape & peach juice which tastes perfectly fine that way — not watered tasting at all. Since Wednesday is the beginning of the new shopping week, I decided not to purchase anything new (besides, I was busy purchasing pantiliners) and hope that some promising sales pan out. ‘Wondered if you donate your extra coupons to your local Food Pantry. The pantry where I volunteered in Texas a few years ago accepted unused coupons (in booklets or cut) at the reception desk. The receptionist cut and/or sorted and filed them in her spare time then left the file container on her desk. This allowed people coming for food to select coupons they might need while they were waiting for their food. We were also glad when people brought in grocery bags and plastic sacks which were always in short supply. I’m sorry and I don’t mean this to sound as bad as I know it will. But your menus have gotten pretty disgusting. I had started out following you really excited but there is no way I could eat like this. You are giving “eat to live” a new meaning. If you do continue maybe you should up to $5-$8 a day and see if you could eat out w/coupons and have the same luck. @Maxine — Truly sorry that you find my meals uninspiring. All I can say is that I am working within a hugely limited budget which also limits what I can buy. Yes, many of my meals are pretty repetitive, but that is because that is what I have on my shelf. I’m sure that if I continued this, I would be able build more of a base and make the meals more “exciting” as the types of food I had expanded. I will fully admit that I am no foodie. I have no problem eating the same thing again and again. And as I mentioned already, I am no cook. I barely stepped foot in a kitchen before I started this. You are probably correct in your thoughts about eating better (or healthier) than most of the us. And I do understand that you have not in the past been much of a cook (and it does not seem much interested in food) but to make this more meaningful to the average person my thoughts (and of course we all know ’bout those opinions) are that the food should at be appealing also. From the pictures it has been gross. LMAO. On to another concern: I’ve seen several post on other websites about coupons that this weekend there won’t be any in the newspapers. @maxine – I would never suggest that anyone should try eating on $1 a day, at least with the current restrictions that have been put in place on this challenge. The main point I was trying to prove to my sister (and decided to share with all) is that it is possible to eat fairly balanced meals on very little without constantly being hungry. I would encourage you to look beyond what I am actually eating to what you could do on a smaller budget than what you have been spending using the same concepts that I have been. As for the lack of coupons this week, it will have little effect on this challenge – the grocery stores have already announced their sales through the week so I am stuck with those sales regardless of any new coupons. That is a huge misconception about coupons. It is matching current sales with coupons which is important, not the new coupons that come each week. Rarely are the new coupons matchable with a good sale the first week. What matters if you want to get the most bang for your buck is the sales that the grocery store has and having saved a good amount of coupons over time so that you can match the sales with coupons. I do “get” what you are doing here. And I did not mean to seem to be throwing stones that was never intended I just had to voice what I have been thinking over the past couple of days. I love what you are doing and would love to see you continue it. I feed a family of 5 for about $350 a month, and many are shocked by how little I spend. And we eat very healthy, fresh vegetarian meals. Perhaps upping your budget to $2 a day! Imagine the food possibilities. I actually find your meals appetizing. I bought a bag of black beans the other day, because I thought the bean tortillas would be good. (Haven’t made it yet – but one day). But I don’t know if you’re really getting all the servings of fruits/vegetables that you need each day. Even if you’re not, you’re definitely eating far better than some people do. OMG! I was thinking just the opposite of Maxine…I was thinking the meals looked pretty darn good! 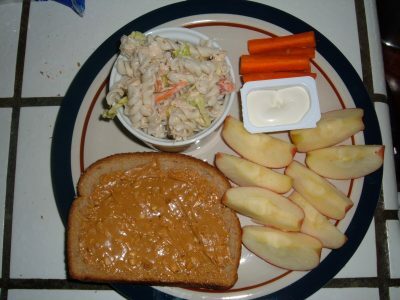 I don’t like to cook or shop either, so I throw together meals all the time that don’t even look as good as your pics! Sadly, I do this on much more than $1 a day, so I don’t even have an excuse. So when I read her comment I felt someone had insulted my *cooking* too…and started laughing. I feel that your meals are fantastic! They seem well-balanced, healthy, and are apparently filling. I don’t think some people quite understand what “eating to live” really means. 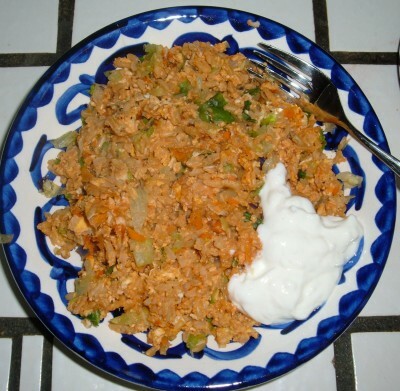 You have spices and a variety of options and flavors with your meals. When I was younger, my family truly had to eat to live; I can remember evenings where my mom claimed to be full so that we could eat just a little more. What you are doing is incredible and will help a lot of people who need it, both those at the pantry and those who are learning how to buy more food with less money. I’m astounded that you’ve spent so little with a retail value of over $500! In the seasonings department, I find that cumin and chili powder make extreme budget cooking vastly more tolerable and tasty. I know I’m coming late to the party, but I’ve been truly fascinated with your challenge. I’m sorry that some people apparently haven’t been exposed to the “if you can’t say something nice” rule. I believe you’re doing an amazing job. I was just looking at your pictures and wondering how many people who only have rice and dirty water to consume, or not even that, would love to have a month of these meals. Bravo. You’ve taught me a lot, and you’ve humbled me into changing some of my behaviors.